So far, one of my favorite things about Madrid is its proximity to day trip-worthy towns by rail. Toledo was my first day trip from Madrid and I enjoyed wandering around this sun-soaked ancient city perched on a small, hilly peninsula. 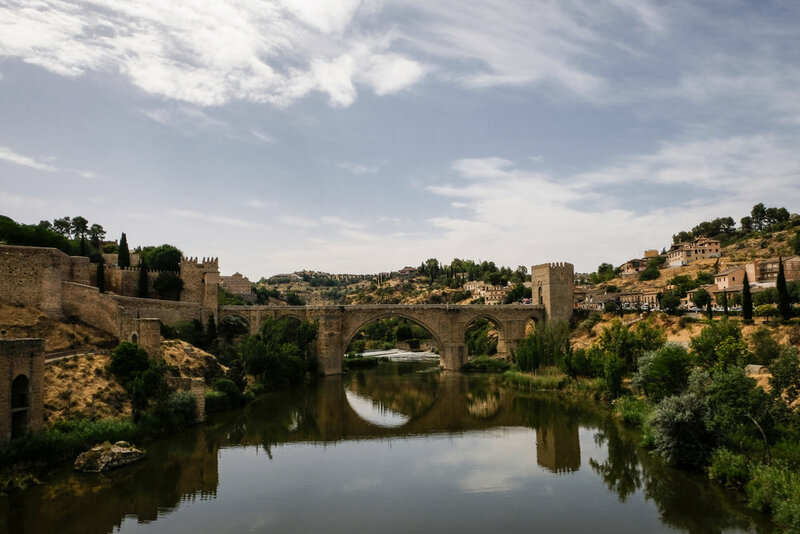 Toledo is a UNESCO World Heritage Site not only because of its rich history and buildings (dating back to the Romans) but also because its people of three different religions – Judaism, Christianity and Islam – lived harmoniously for centuries. Toledo is also famous for being home to Mannerist painter El Greco, and while there is an entire museum dedicated to the artist, I passed it over to see the brilliant El Entierro del Conde de Orgaz in the cozy Iglesia de Santo Tomé. Here are a few more highlights from my quick day trip to Toledo. Enjoy! This fabulous station in itself is worth the trip to Toledo. 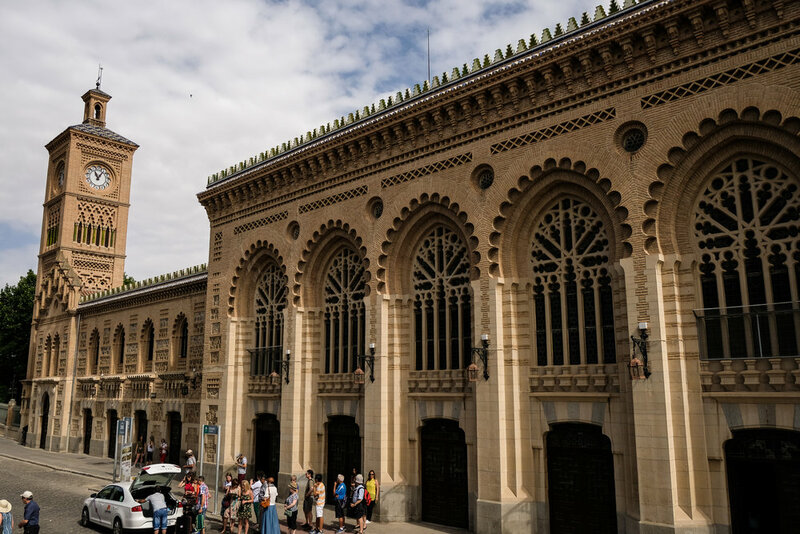 The station was built in 1920 by Spanish architect Narciso Clavería y de Palacios to replace an older station, and he designed the building in the Neo-Mudéjar style. When high speed rail came to Toledo in 2005, the station was completely restored. Seeing de Palacios' architectural flourishes up close is amazing, from coffered ceilings to intricate stained glass to dark carved wood. With its colorful tiles and horseshoe arches, the station closely resembles an Ottoman palace (although the green tiles lining the roof look very Art Deco to me). With Spain's sun feeling especially intense in Toledo and the city center being a twenty-minute walk away, I pulled a tourist move and hopped on a sightseeing bus for a steep $17 (I've quickly learned that it's expensive being a tourist in Spain). I'm on the fence about if the bus was worth it, because Toledo is a small town with most streets closed to vehicles, but I decided the tour bus was worth it after all because I was treated to spectacular views of the city from distance. The bus passed sprawling Spanish estates, or cigarrales, tucked into the hills and representing simpler times in the 15th century. This grand complex was built in 1477 in the Isabelline style by Catholic Monarchs to commemorate their victory at the Battle of Toro. The monastery's courtyard is spectacular with its lush garden and Gothic arches, and the cathedral is somber with Spanish and Flemish influences. Walking up the marble staircase to the upper cloister, the architectural style changes to Flamboyant Gothic and this space reserved for royalty was decorated in the 19th century with grand coffered ceilings and gargoyles. Entrance was about $3.20, or well worth it.